We still play the original 1947 edition of this great game here at home with a "house rule" that you have to attach pieces in numerical order ; example : no 6's (legs) until you have all the other parts in place ... lengthens the game but is more fun. Obi-wan-kenobi...I remember THAT from grammar achool (and the rhyme)....at that age NO ONE wanted to catch 'girl-cooties'...by HS every boy wanted to acquire some form of the malady...if not in freshman year at least by the time he was a sophomore!!! But cooties (body- lice) WERE a serious problem in the trenches (as I said, in all conflicts going back to antuquity - during seiges of citys, the population - if the seige dragged on long enough - would develop body lice due to poor sanitation, water shortages, etc)...in fact according to the source I checked (IIRC Wikipedia - yep - I just rechecked) the earliest use of the word in english was by the Brits in the Great War...the bug DOES look like a louse....sorta. Cooties were a factitious social bug or virus that kids of that generation would joke about. You wouldn't want to use some other guys comb because you didn't want to get his "cooties." If you were in elementary school back in the late 1950's, no one wanted another person's cooties. Your sister's cooties were probably the worst cooties of all. I believe this toy / game was in response to the Cootie craze! 'Cooties' were/are body lice...the scourge of the trenches during the 'Great War'...not only of that war, but other earlier conflicts gouing back to antiquity...the results of bodies closely packed together and poor sanitation. Mr. Potato Head gone insect. 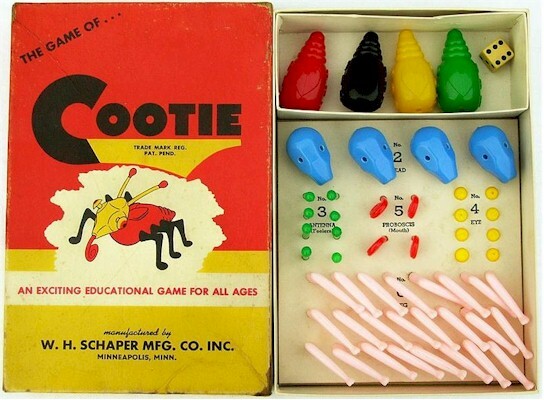 "Cootie always leaves you laughing...oh, ho, ho, ho ho!"